Adámas in ancient Greek means ‘unbreakable’ and it is the origin of the word ‘diamond’, so it is an appropriate name for this specially-commissioned, diamond-set unique piece. Adámas features an 18k gold dial set with 560 scintillating diamonds. The exceptional dial is the work of talented, up-and-coming designer Fiona Krüger. Five sizes of diamond feature in the dial – 145 x 0.7mm, 145 x 0.08mm, 94 x 0.09mm, 72 x 0.1mm, 104 x 1.10mm – forming an intricate pattern that has been carefully designed by Fiona to appear ‘organic’. The dial forms a spectacular backdrop to the central hour and minute ‘Foundation’ hands in polished stainless steel. Adámas features the Speake-Marin in-house SM2m calibre housed in the iconic Speake-Marin Piccadilly case in noble 18K white gold, set with 239 diamonds, each 1.6mm in diameter. The diamond-set 18k white gold crown is complemented by the bezel set with 76 brilliant-cut Top Wesselton diamonds. 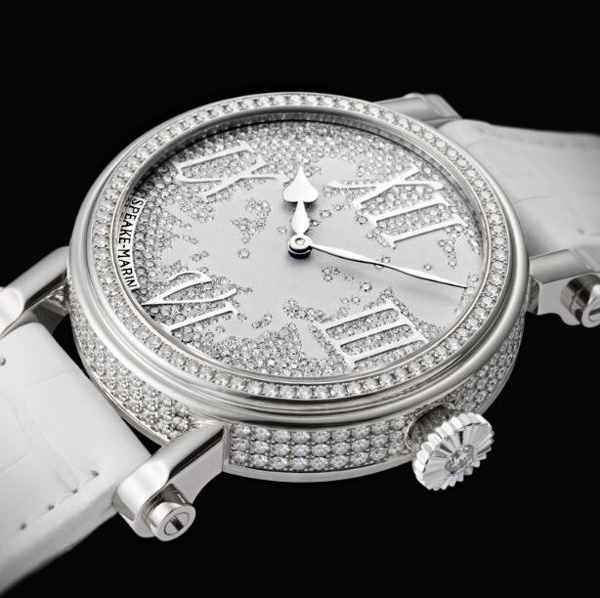 “Peter asked me to create a ladies' watch, the brief being an organic looking diamond pavé piece. There are countless diamond pavé watches for ladies, so I wanted to create a watch where the use of diamonds made complete sense. The concept would have to be one which revolved around the diamonds themselves rather than using them only for their decorative appeal. 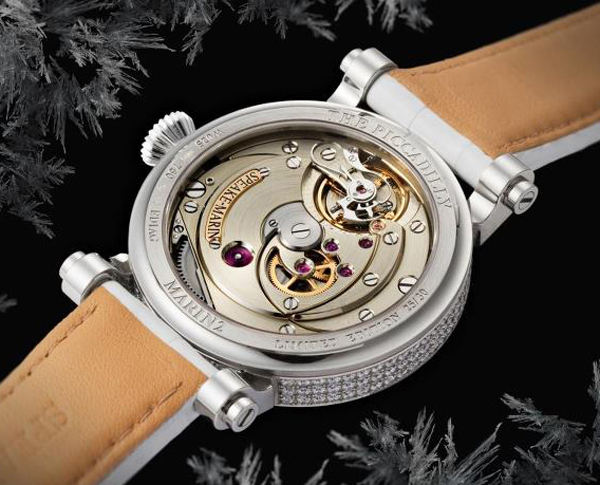 “The idea for the Adámas was to use the diamonds as the organic element of the timepiece. 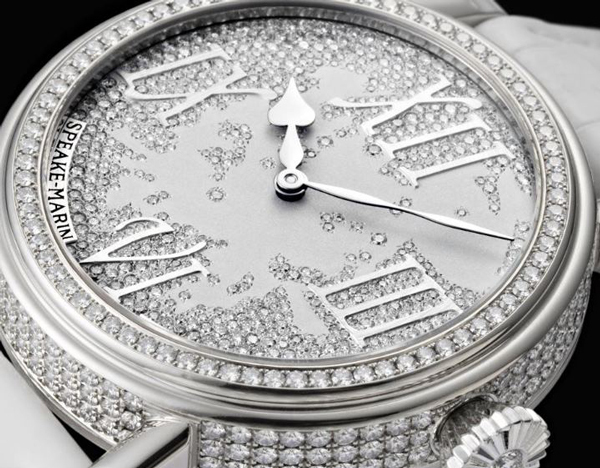 The concept was to have the diamonds 'growing' into the watch, from the case right into the dial, referencing their formation and dispersion in nature. 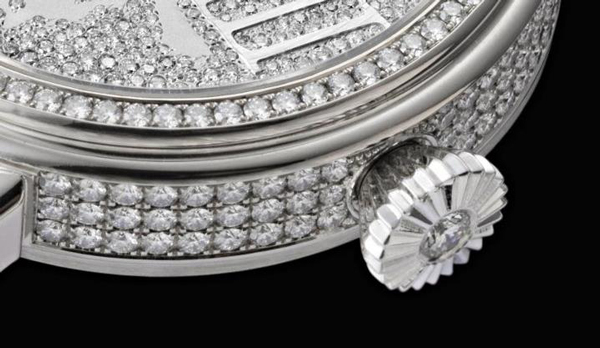 “Most diamond pavé watches have a very strict pattern used simply to decorate the piece. I wanted there to be a narrative between the diamonds themselves and the rest of the piece: a contrast between the 'untameable' diamonds and the strong classic look of Peter’s watches. “The numerals themselves were designed especially for this dial as they needed to be strong enough to stand out amongst the diamonds, yet feminine and classic enough to work alongside Peter's iconic Piccadilly case. Fiona took a meticulous and panoptic approach to developing the design of the Adámas dial. The following sketches, renderings, photos and notes from Fiona provide a fascinating glimpse into this designer’s modus operandi.